Pasofami a japanese NES/SNES/GB emulator has been updated. BizHawk is a multi-system emulator in C#. - Fixed: The "Detect" window for the Launcher never work when the default installed Language in Windows is not English (US). Declined as usual in two sizes (standard and XL), it includes some new interesting, judge for yourself: - best viewing angles (especially in 3D) - Best Displays - more power - the presence of an NFC module ( compatiblilité amiibo) - better battery life - replaceable shells (38 skins, 1500 yen per model) - second analog (well stick) - 2 buttons additional tranche (ZL and ZR) - microSD slot The old school touch buttons ABXY high risk of capsize the heart of the high retrogamers the Super Nintendo, especially the white model which is just beautiful, it must be confessed. Note that the cartridge port, stylus, the power button and the headphone jack are located on the front edge of the console, simplifying the overall design of the console (with only the HOME button is left in the middle, on the bottom screen). A new charging dock is also emerging. JoostinOnline has updated SysCheck HDE to version 2.3.0. This Wii/vWii application does several checks on installed IOS and custom IOS. See the change log for what's new, and join the on-going discussion for more information about this project. v2.3.0 • Added a new argument --skipIOS, which lets you skip any specific IOS in the scan. This is useful for freezes. Multiple arguments are supported. • Fixed a translation for "Unknown"
Ready to School ? Rush ! Rush ! Pencils, erasers, inkjets are all after you. Your only weapon lies in stunned dumb sharpeners. Your mission is to avoid drowning in the raising ink. There's only two levels so far, but beating them will give you access to increased ink speed, and will insist on you finding new paths, mastering new moves to compensate lost platforms. So don't wait longer. Dust off your linker and grab Bilou : rush to completion to take the challenge. VOiD has released a set of tools with source code which decrypts 3DS game ROMs (.3ds). Those of you in the 3DS scene have probably been following Smealum’s recent activity with excitation. The French hacker announced several months ago that he was working on homebrew support on the latest firmwares for the 3DS. Until now, homebrew on the 3DS has been limited to older 4.x firmwares, and requires the use of expensive flashcarts. Smealum has confirmed his hack will not require a flashcart. It will, however, require a specific 3DS game to trigger the exploit. Smealum has confirmed to me that the game is available on physical cartridges, and, in one locale, on the Nintendo eShop. Bottom line is, if you are interested in this exploit you will need to purchase that game, and most likely you will want the physical version of it, not the eShop version (in particular because Nintendo would not be able to patch or remove the physical version from your device). The exploit has been confirmed to work on 3DS, 3DSXL, and 2DS, on all firmwares from 4.0 to 8.1. 3DS Homebrew Menu release delayed! Update: the release of the homebrew loader will be delayed due to the soon to be released new 3DS (which is actually pretty cool, as it's kind of what the DSi was to the DS, with upgraded hardware, better design, etc). Hopefully the exploit will work on that 3DS as well so the homebrew loader can be released asap! 3dmoo Git (2014/09/01) is compiled. 3dmoo is an open-source Nintendo 3DS Emulator Prototype. It does not run games (yet). Nestopia Git (2014/09/01) is compiled. This project is a fork of the original Nestopia source code, plus the Linux port. The purpose of the project is to enhance the original, and ensure it continues to work on modern operating systems. WinDS PRO 2014.09.1 is released. WinDS PRO is a Nintendo DS & GameBoy Advance emulator package. This have NO$Zoomer, NO$GBA, NO$MOOZ, NOZ, myZOOM, NGZoom, NO$GBA 2X, iDeaS, DeSmuME, VBA Link & VBA-M.
Dolphin, Citra, 3dmoo, Play !, PCSX2, BizHawk, PPSSPP, rpcs3. kindred 1.06 Preview Build 1 is released. kindred is a multi-system video game emulator for Windows. A work-in-progress for more than a decade, the software utilises a number of priority technologies to accurately emulate video games systems. Dolphin Git 4.0-2824 is compiled. This is the trunk of Dolphin Project. Dolphin is the first Gamecube emulator able to run commercial games! Dolphin is a Gamecube, Wii and Triforce (the arcade machine based on the Gamecube) emulator which supports many extra features and abilities not present on the original consoles. It has a partial Wii support and plays most Gamecube games. - Clean up brace placements within the project. Why the **** were we calling new on this function? Citra Git (2014/08/25) is compiled. Citra is an experimental open-source Nintendo 3DS emulator/debugger written in C++. At this time, it only emulates a very small subset of 3DS hardware, and therefore is only useful for booting/debugging very simple homebrew demos. Citra is licensed under the GPLv2. Refer to the license.txt file included. * Core: Change HW update to happen on thread switch, fixes GSP synchronization. Remove documentation for external modules. * Remove documentation for external modules. We don't need these and they clutter up the repository. DeSmuME SVN r5048 is compiled. DeSmuME is an open source Nintendo DS(NDS) emulator for Linux, Mac OS and Windows. DeSmuME supports save states, the ability to increase the size of the screen and it supports filters to improve image quality. DeSmuME also supports microphone use on Windows and Linux ports, as well as direct video and audio recording. The emulator also features a built-in movie recorder. It's an interesting week on the Nintendo eShop, though perhaps not a terribly thrilling one. The big highlight is a Theatrhythm Final Fantasy: Curtain Call demo. The demo will let you sample two songs from the rhythm game, and players can transfer their save data to the full game, which launches September 16. Also on the Wii U this week are two strategy games, Cubemen 2 and the Virtual Console release of Nobunaga's Ambition. On the 3DS side of things, the Virtual Console picks up Street Fighter 2010: The Final Fight, a futuristic NES action platformer that Capcom claims has something to do with Street Fighter's Ken. It's weird. It's called the "new" 3DS and the "new" 3DS LL. It's faster with "new" 3DS viewing. 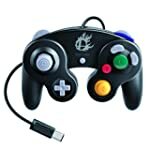 It also has "Amiibo" function and a new analog pad call the "C-stick." Wow! This sounds great. 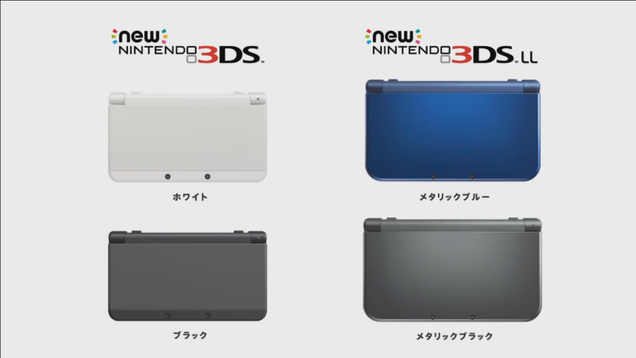 The New Nintendo 3DS is priced at 16,000 yen ($154) and the New Nintendo 3DS LL is priced at 18,800 yen ($181). Both will be out October 10 in Japan. Here's some pics of the new one or you can check out what's different between the old and new 3DS here. 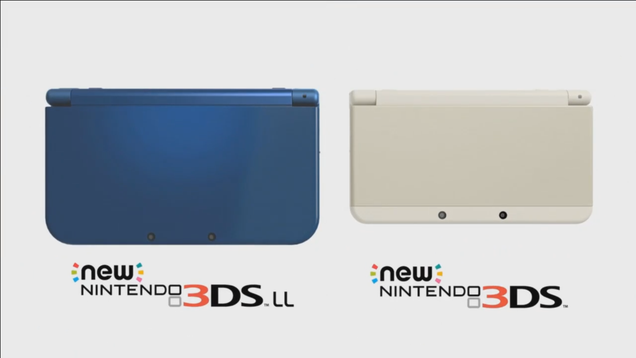 The New Nintendo 3DS comes in White and Black, while the New 3DS XL comes in Metallic Blue and Metallic Black. 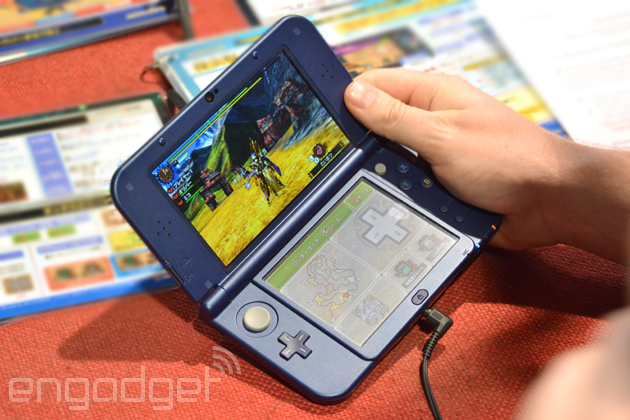 Note that in Japan, the 3DS XL is called the "3DS LL." The New 3DS also has colorful face buttons. 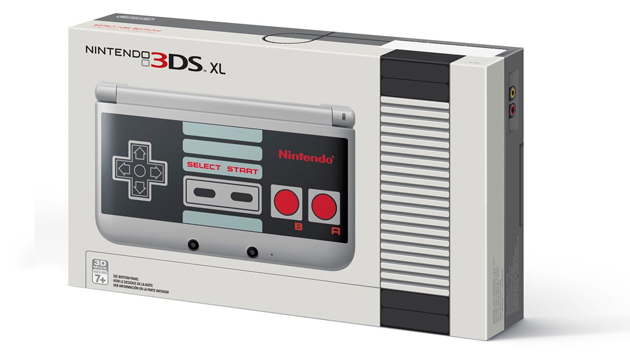 Nintendo will maintain its policy of strict region locking with the New Nintendo 3DS and New 3DS XL models. All current 3DS models employ rigid a region locking policy, which only allows 3DS consoles from Japan, US or Europe to play games from the same region. The recent announcement of the New 3DS models offered some hope that Nintendo would respond to long-running fan outcry over the locking policy with a region-free SKU. But this will not be the case, a Nintendo rep told to Gamespot on Wednesday, confirming the presence of region-locking restrictions on the new consoles. A fan petition asking Nintendo to make the Wii U, 3DS and Wii region-free had gathered over 12,000 signatures back in July 2013. Now, in September 2014, that count sits at 31,946. While Nintendo's home consoles, including the Wii U, have always employed some form of region restriction, the firm's handhelds were traditionally region-free. The 2009-released Nintendo DSi was the first Nintendo handheld to feature regional restrictions, with DSi-compatible software only playable in the territory it was released. Nintendo has previously claimed that the 3DS is region-locked "to provide the different parental controls to deal with the ratings in each territory". Nintendo president Satoru Iwata blamed the firm's region locking policies on the need to adhere to 'legal restrictions' in different countries. Sony's PS Vita handheld is region-free, as is the PS4. Region locking functionality exists in the PS3 and Xbox 360 consoles, but games on those platforms rarely employ the restriction. Nintendo announced the upgraded versions of the Nintendo 3DS and Nintendo 3DS XL on Friday last week. Referred to simply as the 'new 3DS' and 'new 3DS XL', the systems will be coming to Japan this year and in Europe and North America in 2015, and feature a number of new improvements over the current models, including a faster CPU, dual analogue sticks, face tracking for improved 3D, built-in NFC functionality and more. Your planet is destroyed, and you must escape. But beware, because you still a dangerous bounty hunter. Your mission is to escape without destroying your ship already degraded. not have breaks or weapons, only your skill will save you. This game features a table online world to see the records of the best players and has several levels of play. Do you accept the challenge? The NES-Emulator Nestopia Undead has been updated to version 1.46. Oscar Richard from Mexico comes up with a work in progress of his new NES Game Young Oscar San. Once you start playing, you may find it hard to believe that this is a hack of the original Legend of Zelda. New items, new sword mechanics, new graphics, new music (different sound engine, even!) and a world twice as large as the original… there is little left that hasn’t been extensively modified. This hack will keep on wowing you right up to the very end. The Final Fantasy V advance that restores the sound has now been updated, it now features 100% authentic music and sound effects, and supports all three versions of the ROM (Europe, Japan and America). Even the reverb was made to sound like the original SNES version. This version also fixes things that were even wrong in the original GBA release (and previous versions of this hack) : The correct music now plays in correct places, and the framerate drops in the game are eliminated. DanB shares dumps of the 4 floppy disks that came with his recently acquired VUE-Debugger kit. These disks contain by far the latest known versions of neat stuff like the VUCC compiler or the sample programs. We've been following the work of 'smealum' for a while now on cracking the Nintendo 3DS handheld to run 'homebrew' in full 3DS mode without the need of any 'flashcart'. And last week finally he was tweeting it is up and running on the latest v8.x firmware, and he gotten a graphic artist to code up a cool menu for the launcher, and also started 'teasing' hints of the retail game you need either in physical or eShop form, saying it is 'old & cheap' and available in all regions. But now with the big announcement from Nintendo on the super-duper 'New 3DS' with its better CPU and other features, 'smealum' has decided it is best to put his 'exploit' on hold until the system comes out, so Nintendo is more ****ed if his exploit works or can be updated to work also on the brand-new 'New 3DS' model. Oh'well, you can thank big 'N' for putting our v8.x 'homebrew' ideas on hold without the need of Gateway 3DS flashcart. I am pleased to present " This Land Precious DS "remake / adaptation of the play" The Precious Land "of Ishisoft for Nintendo DS. This is a sandbox game in which you will learn the workings of nature and create your landscape types. This is a version 0.9 because it is not completely finished but the game is fully playable. This Precious Land DS is a game of sandbox, this is the remake for Nintendo DS project "This Precious Land" Ishisoft. Author's Website : * Unzip the archive and copy the file to your ThisPreciousLand_DS.nds flash card. -------------------------------- ------------------------------- Description gameplay: - Use the stylus to select the desired resource (Top of touch screen). - Use the stylus to select the tile to be placed on the grid. - Use the stylus on the blank page at the bottom left to start a game. ------------- -------------------------------------------------- Version history: Version 0.9 (06-09-2014) . - Initial and Playable Version To do: - Animation of recovered resources. - Fusion of Tiles "Water" Animation + cumulative "Resources. - logo.bmp for display Logo on the linkers. -------------------------------------------- ------------------- Programming: Cid2Mizard. graphics. Craig Forrester (ishisoft) Programs used: devkitPro, PAlib, Maxmod. Page offers version 0.2 of " zIIP "clone of the puzzle game" Zoop "on Wii. Well, the update date, but she came out one way, it must be said, could not be more discreet in his time. Nestopia Git (2014/09/07) is compiled. This project is a fork of the original Nestopia source code, plus the Linux port. The purpose of the project is to enhance the original, and ensure it continues to work on modern operating systems. Dolphin Git 4.0-3093 is compiled. This is the trunk of Dolphin Project. Dolphin is the first Gamecube emulator able to run commercial games! Dolphin is a Gamecube, Wii and Triforce (the arcade machine based on the Gamecube) emulator which supports many extra features and abilities not present on the original consoles. It has a partial Wii support and plays most Gamecube games. Fceux SVN r3079 is compiled. FCEUX is a cross platform, NTSC and PAL Famicom/NES emulator that is an evolution of the original FCE Ultra emulator. Over time FCE Ultra had separated into many separate branches. The concept behind FCEUX is to merge elements from FCE Ultra, FCEU rerecording, FCEUXD, FCEUXDSP, and FCEU-mm into a single branch of FCEU. As the X implies, it is an all-encompassing FCEU emulator that gives the best of all worlds for the general player, the ROM-hacking community, and the Tool-Assisted Speedrun Community. Fixed rerecord counting broken outside taseditor since r2974. 3dmoo DSP Git (2014/09/06) is compiled. 3dmoo DSP is a branch of 3dmoo. 3dmoo is an open-source Nintendo 3DS Emulator Prototype. It does not run games (yet). DeSmuME SVN r5050 is compiled. DeSmuME is an open source Nintendo DS(NDS) emulator for Linux, Mac OS and Windows. DeSmuME supports save states, the ability to increase the size of the screen and it supports filters to improve image quality. DeSmuME also supports microphone use on Windows and Linux ports, as well as direct video and audio recording. The emulator also features a built-in movie recorder. Gearboy Git (2014/09/03) is compiled. Gearboy is a Nintendo Game Boy emulator written in C++. The emulator is focused on readability of source code, but nevertheless it has good compatibility. A lot of effort has gone into this in order to follow OOP and keep it as simple as possible. Nintendo continues its holiday push with an 8-hour "gameplay" stream this week that's set to feature among others the handheld Super Smash Bros. The House of Mario is broadcasting from its American headquarters this Friday, September 12, though it didn't give specific times to tune in. Nintendo said it'll first "be covering some upcoming games" for Wii U and 3DS before getting into gameplay, but it coyly kept what those other games are beneath its cap. If you need another method of controlling Super Smash Bros whenever it actually releasesfor Wii U, Nintendo apparently has you covered. Spotted by a Japanese gamer on Twitterand IGN (the handheld version is already out in the East), the 3DS version offers the option to connect the portable to Nintendo's HD console to exchange customized characters. What's more, there's a menu saying that you "can use it as a controller," too -- perfect for any future couch-based tournaments, we'd imagine. Granted, you'll almost assuredly have to own the game on both platforms for this to happen, but what Nintendo fan wouldn't anyway? We've reached out to Nintendo for confirmation on the matter and will update this post should we hear back. A patent recently filed by Nintendo, Ambrella and The Pokemon Company suggests that a new gadget is in the works, but details beyond that are scant. According to the filing, the device would be an "information processing apparatus" with wireless communication capabilities and the ability to read NFC and RFID chips (like those found in Nintendo's Amiibo figures), along with the integrated circuit chips most commonly seen in credit cards. The mystery device was invented by Norio Matsumura, director at Ambrella and a frequent collaborator on Pokemon games. Matsumura's involvement, along with the patent filing which lists The Pokemon Company as one of three assignees indicates that the device will have some link to Nintendo's intensely popular monster catching franchise, though here again details are sorely lacking. 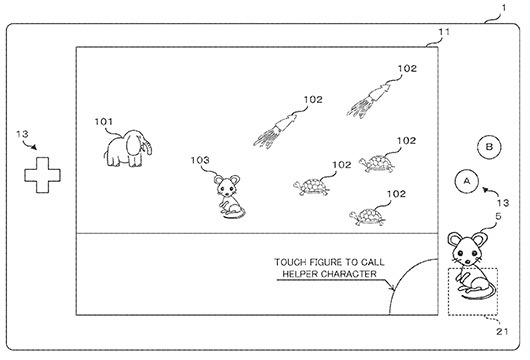 While NeoGAF commenters have concluded that this patent is some kind of Pokemon gaming system, the patent filing does not offer enough information to support that idea. It could just as easily be a real-world Pokedex analogue or something completely unrelated to diminutive Japanese monsters. Only time will tell what Nintendo has in store, but while we wait, we invite you to leave your ideas on what this gadget might be in the comments below. Best response wins nothing, but your parents will be proud. Oh, the NES... simpler times. Blowing into cartridges, power gloves, cheat codes, Minus World, R.O.B. and The Wizard. 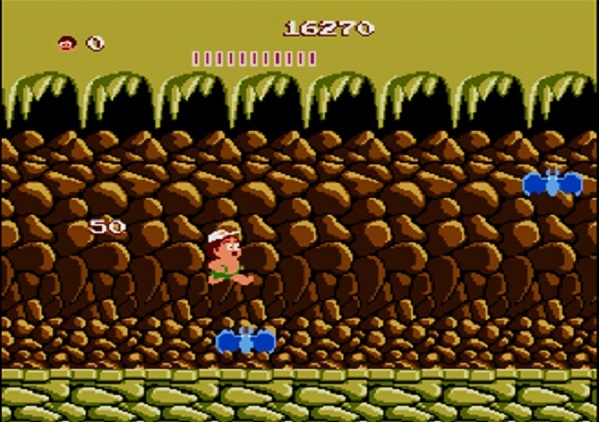 It was a time when people could makeAdventure Island, a game in which a rotund man clad only in tiny green shorts and a white cap went running, jumping and skateboarding around the forests and caves of the South Pacific. And, with the help of a fairy called Honey Girl, he saved a princess from a witch doctor. Time-travelers, take yourselves to the Wii U this week and go skate some clouds. If you want something a bit fresher on Wii U, Teslagrad offers Metroid-like platforming with a dollop of electromagnetism, steampunk and Eastern European art. 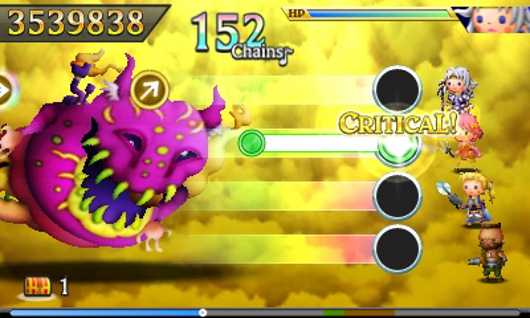 There's also the kung-fu rhythm of Kickbeat, and on 3DS you've got first-person, old-school dungeon crawler . 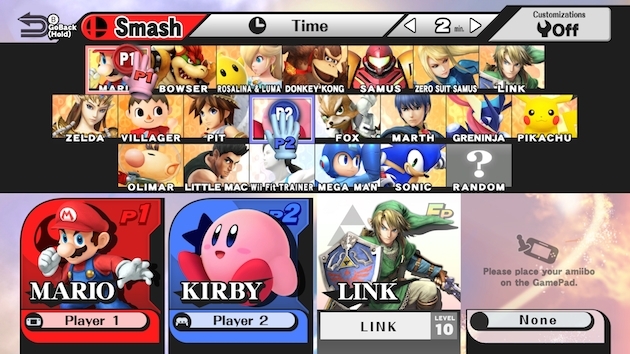 Apart from that, Nintendo's pre-Super Smash Bros. sale is also worth a look. Running through until the release of Smash on 3DS, the big N's discounting games starring the fighter's roster. Check out the Smash sale here and all the other discounts, and jump past the break for the full list of new releases. Nintendo has announced a free game promotion for new European 3DS owners. Register a Nintendo 2DS, Nintendo 3DS or Nintendo 3DS XL with Club Nintendo between September 11, 2014 and January 12, 2015. Register a copy of either Super Smash Bros for Nintendo 3DS, Pokemon Omega Ruby or Pokemon Alpha Sapphire between October 3, 2014 and January 12, 2015. Players will be able to request the code through their Club Nintendo account, and will have to do so by February 12, 2015. Nintendo says the offer is only open to customers in the UK, Ireland, Germany, Austria, France, Spain, Italy, Belgium, Netherlands, Portugal, Switzerland, South Africa and Russia. our friends all over the globe! - Palette configuration is now specific to the selected region (NTSC, PAL, and Dendy/Hybrid) rather than the CPU/PPU clock divider ratio. Additionally, both PAL and Dendy mode will now swap the Red and Green color emphasis bits as has been observed on actual hardware. StapleButter offers version 1.0 of " blargSnes "Super Nintendo emulator for the Nintendo 3DS. libertyernie 2.3.0 offers an excellent emulator Game Boy / Game Boy Advance Nintendo for the Wii " Visual Boy Advance GX "porting VBA-M .
DeSmuME SVN r5054 is compiled. DeSmuME is an open source Nintendo DS(NDS) emulator for Linux, Mac OS and Windows. DeSmuME supports save states, the ability to increase the size of the screen and it supports filters to improve image quality. DeSmuME also supports microphone use on Windows and Linux ports, as well as direct video and audio recording. The emulator also features a built-in movie recorder. fix obvious crashy bug in NAND cards when booting from firmware, but for some reason the card isn't detected still. improve previous commit, which was just plain buggy. now card is detected again. but... the game crashes when trying to boot. Dolphin Git 4.0-3247 is compiled. This is the trunk of Dolphin Project. Dolphin is the first Gamecube emulator able to run commercial games! Dolphin is a Gamecube, Wii and Triforce (the arcade machine based on the Gamecube) emulator which supports many extra features and abilities not present on the original consoles. It has a partial Wii support and plays most Gamecube games. 3dmoo Git (2014/09/15) is compiled. 3dmoo is an open-source Nintendo 3DS Emulator Prototype. It does not run games (yet). Monster Hunter 4 Ultimate Collector's Edition (Nintendo 3DS) Release Date, Pre-orders LIVE! 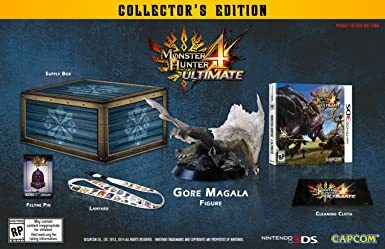 Pre-orders for the upcoming release of Monster Hunter 4 Ultimate Collector's Edition (Nintendo 3DS)have kicked off at Amazon! Monster Hunter 4 Ultimate Collector's Edition (Nintendo 3DS) has a scheduled release date of March 31, 2015. 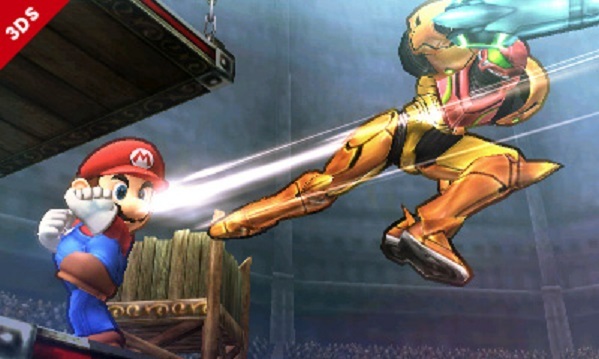 Super Smash Bros. for 3DS has sold more than 1 million units in its first few days. According to data from Media Create, Super Smash Bros. has cleared the 1 million sales milestone despite only being released on September 13. That figure also includes digital sales. Super Smash Bros. is just one title to have passed 1 million units in its first week on Nintendo's dominant handheld, perhaps the only platform in Japan popular enough to support software sales at that level. The game will be released in North America, Europe and Australia next month. The Wii U version will also be released this year - a game that Ubisoft's Alain Corre recently described to us as the console's best chance at gathering some much needed momentum. Nintendo's New 3DS is getting Poke-themed limited editions in Japan to mark the launch of Pokemon Alpha Sapphire and Omega Ruby. The red Groudon and blue Kyogre systems are coming to the country's Pokemon Center stores alongside the games on November 21, and both handhelds feature suede faceplates for that extra luxurious feel you've always craved maybe when capturing pocket monsters. If you want in it's 19,000 yen (around $177) a piece, and they don't come with copies of the games. The New 3DS itself launches in Japan on October 11 in both regular and XL models, and its New features include the right-hand analog C-stick, ZL and ZR shoulder buttons, built-in NFC tech, greater battery life, improved CPU andcustomizable faceplates, suede or otherwise. As for when the New 3DS launches outside of Japan, Nintendo's ruled out bringing it West in this calendar year. But you can nab Alpha Sapphire and Omega Ruby when the two 3DS remakes launch in North America on November 21 and Europe on November 28. Retro gaming projects on Kickstarter are pretty common, but here's one that's a bit different: a game cartridge that, when plugged into the original Nintendo Entertainment System, plays an 8-bit game, and when plugged into a Mac or PC (via USB) plays a modern version of the same game. Perhaps the coolest aspect is that the two versions will interact with each other; an ability or weapon unlocked in one is available to futz with in its cousin. That is, if the project's Kickstarter is funded, of course. As Mystic Searches' project lead Joe Granato IV tells it, the concept comes from a design document he drew up, quite literally, as a seven year-old back in the '80s. You might have heard: Nintendo's refreshing its 3DS family with two new models. Both the New 3DS as well as the larger New 3DS XL will arrive with a diddly analog stick just above the action buttons. (Throw away your Circle Pad Pros!) Plus, there's built-in NFC for those incoming Nintendo figurines and a new microSD card reader. Unfortunately, in my fly-byMonster Hunter 4G gaming test, I didn't have the chance to try either of those features -- readers love SD slot close-ups -- but it does offer an estimation of what Japanese gamers will get in less than a month when both handhelds launch. There's still no word on an overseas release for either model, but for now, watch me prove how poor I am at Monster Hunter in our video after the break. No, far worse than that. God of War 2 for NES Released!!! With the successful release of the NES version of God of War Earlier this year comes the second installment of the 8-bit series. The first game involved Kratos proving himself worthy enough to be saved by the God of War, Ares. This latest release pits Kratos against a mysterious sorcerer that has imprisoned the Gods with powerful dark magic. The Gods aid Kratos with what little power they have left as power ups in the forms of Lightning, Hades Army, a gorgon head, and a mace. Download both of these exciting games now!!! Take on a rapid-fire onslaught of challenges and mash-ups from 16 of Nintendo’s finest 8-bit games! Test your skills on a gauntlet of quick, tricky challenges and remix stages that combine parts of different games. The best mix of titles from the NES™ Remix and NES™ Remix 2 games is on Nintendo 3DS. Now you’re playing with PORTABLE power!Link™ vs. Donkey Kong™! Kirby™ vs. Boo™! It’s mash-up mania in this celebration of all things NES™! Race through to earn stars on increasingly tough tasks, like beating Ridley from Metroid™ or making Princess Peach™ save herself! Compete in Championship Mode’s blitz of challenges from the Super Mario Bros., Super Mario Bros.™ 3, and Dr. Mario™ games, then compare scores with others in your region via online leaderboards*. Development Nintendont being perpetual, with its share of almost daily versions, it is difficult to follow each build (for both users and Newsers). Instead, a point is made ​​about GX-Mod every major advance of this loader Gamecube, and it's time to make one. Since revision 153 (05/09/2014) adds Nintendont feature long requested and awaited (especially by the players on vWii): support for Wiimotes. The icing on the cake, the MAJ 160 (09.15.2014) also adds support for joysticks WiiU Pro. Dolphin Git 4.0-3350 is compiled. This is the trunk of Dolphin Project. Dolphin is the first Gamecube emulator able to run commercial games! Dolphin is a Gamecube, Wii and Triforce (the arcade machine based on the Gamecube) emulator which supports many extra features and abilities not present on the original consoles. It has a partial Wii support and plays most Gamecube games. - DolphinWX: Fix case where the debugger would crash on hiding a pane. Project64k Stable Version (2014/09/17) is released. Project64k is a version of the Project64 emulator that supports multiplayer games using the Kaillera network. Project64k is an online Nintendo64 emulator that uses Kaillera Netplay, and the additional P2P option (comes with the Kaillera Client) and AQZ option (input plugin). Project64k on Kaillera cannot properly sync many games, however It can play the main games played just fine. To play games like Goldeneye007 or Perfect Dark on Kaillera you will need Mupen64k the alternate (less stable) Project64k. 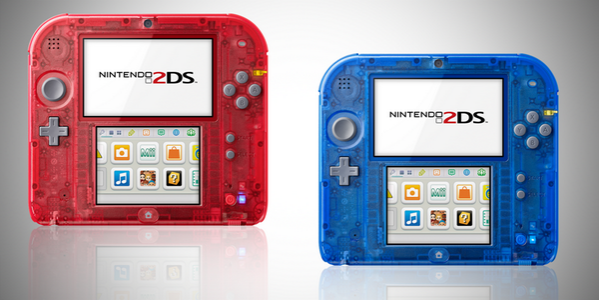 2DS to go see-through in EU with new designs, out in Nov. The transparent bundles clearly come with the games pre-installed on a 4GB memory card, with the red system including Omega Ruby and the blue systemAlpha Sapphire. Nintendo is hosting a Super Smash Bros 3DS tournament at GameStop stores across the United States on October 4, the day after the game launches. Tournaments will be held at 16 stores across the country, including 15 GameStop locations in California, Colorado, Illinois, Massachusetts, Maryland, North Carolina, New York, Washington, Florida, Georgia and Texas, plus the Nintendo World store in New York. "Participants for the 64-player local tournaments on October 4 are selected on a first-come, first-served basis with no pre-registration required," Nintendo says in a press release. "Participants may bring their own Nintendo 3DS or Nintendo 2DS systems and/or Super Smash Bros for Nintendo 3DS games to the tournaments, but are not required to do so." Tournament winners will be flown out to the New York Nintendo World store on October 11 to compete in the Super Smash Bros for Nintendo 3DS National Open Tournament. See the full list of GameStop stores hosting tournaments on October 4 in the press release below. When Nintendo first revealed new versions of the 3DS and 3DS XL handhelds last month it was unclear if the device would be released globally or if it would be exclusive to Japan. Thanks to a new Nintendo Direct, we now have an answer. Below the break you'll find what Tom Enoki, managing director of Nintendo Australia, describes as the "first Australian Nintendo Direct" video. The nearly 15-minute clip focuses on a number of upcoming 3DS games - Super Smash Bros. in particular - and also reveals word that the new model will launch in Australia and New Zealand on November 21. 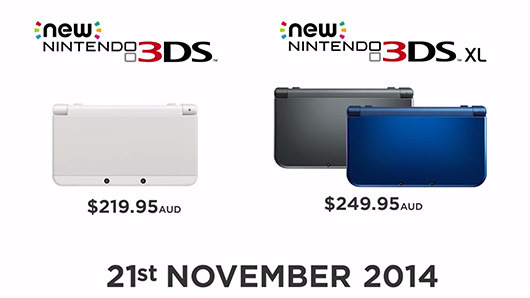 The 3DS will bear a price of $220AUD while the 3DS XL is priced at $250AUD. That's great news for people living in those regions, but it also suggests that the new 3DS models may be coming to Europe and North America as well. If nothing else, those regions offer Nintendo far more potential sales than the gaming giant would see by launching exclusively in Japan, Australia and New Zealand. Link and company hit the crowded battlefield in this week's US eShop update, led by Nintendo and Omega Force's Hyrule Warriors. Principally developed by the studio behind Dynasty Warriors, Hyrule Warriors lets players control familiar Zelda characters in massive skirmishes against monsters like Moblins, Lizalfos and more. In CVG's Hyrule Warriors review, we said it "has taken Zelda and turned it into all-out war, without compromising its core ideals". The first Yu-Gi-Oh card-battling title for 3DS arrives this week, and users will find a demo of Spin the Bottle: Bumpie's Party on Wii U along with a temporary discount. [h=3]Nintendo eShop on Wii U[/h]Hyrule Warriors - It's time to fight. Cut down entire legions of enemies as Link, Zelda and other characters from The Legend of Zelda series using over-the-top, powerful Dynasty Warriors-style moves. This legendary adventure through the beloved locales of Hyrule will have you battling the fiercest enemies in The Legend of Zelda history. Collect materials and rupees to enhance your characters, upgrade weapons and dominate. 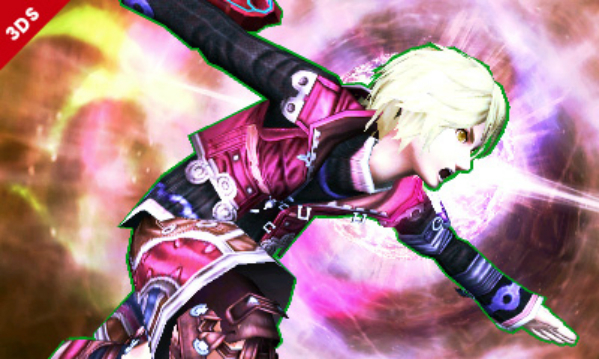 Hyrule Warriors will be available on Sept. 26. [h=3]Nintendo eShop on Nintendo 3DS[/h]Yu-Gi-Oh! ZEXAL World Duel Carnival - The first Yu-Gi-Oh! video game for Nintendo 3DS brings characters and stories from the popularYu-Gi-Oh! ZEXAL animated series to life. Play as one of 12 characters, each with his or her own storyline, and battle with 40 Duelists from the TV show to compete in the World Duel Carnival. Enjoy multiple game modes, a tutorial and customization options as you play with more than 5,700 cards from the Yu-Gi-Oh! trading card game. Clickhere to watch a trailer for the game. [h=3]Nintendo eShop Sales[/h]It's your last chance to save up to 40 percent on select games starring fighters from the upcoming Super Smash Bros. for Nintendo 3DS. This week includes games featuring Kirby, Donkey Kong and other classic characters. Check out the games athttp://www.nintendo.com/eshop/offers. Spin the Bottle: Bumpie's Party is 30 percent off (reduced from $11.99 to $8.39) until 8:59 a.m. PT on Oct. 12 in the Nintendo eShop on Wii U.
Armillo is 37 percent off (reduced from $7.99 to $4.99) until 8:59 a.m. PT on Oct. 6 in the Nintendo eShop on Wii U.
Swords & Soldiers is 33 percent off (reduced from $2.99 to $1.99) until 8:59 a.m. PT on Oct. 9 in the Nintendo eShop on Wii U. Glory of Generals is 30 percent off (reduced from $9.99 to $6.99) until 8:59 am PT on Oct. 9 in the Nintendo eShop on Nintendo 3DS.